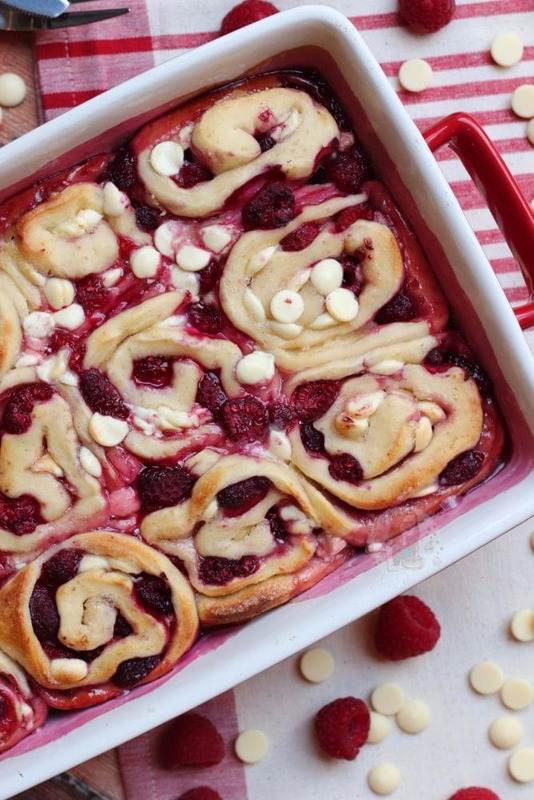 Sweet, Soft, Delicious and Moreish White chocolate and Raspberry Rolls! It’s been a while since I posted a Bread like a recipe, and yes this is still a ‘sweet’ recipe and not savoury, but at least its something Bread related! I could have gone for another cupcake or something, but for now, I was desperately in the mood for Sweet Rolls. 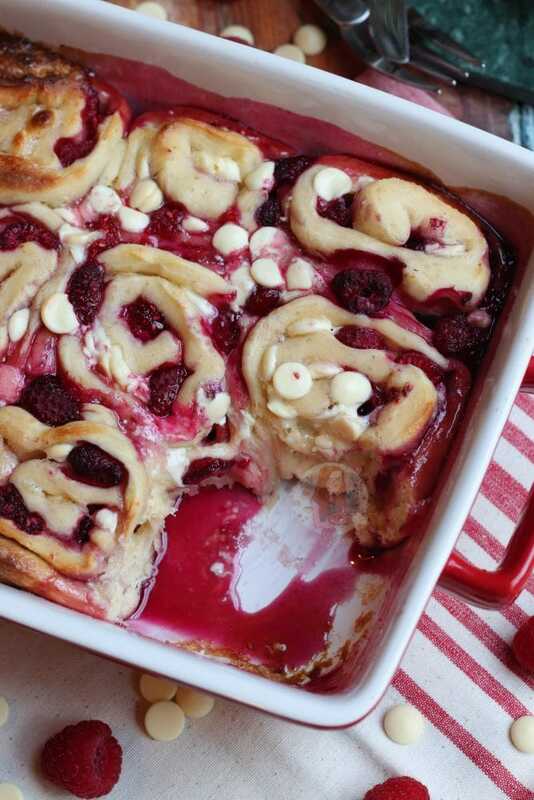 I won’t lie, this is incredibly much based on my Lemon & Blueberry Sweet Rolls… but hey ho. Yum. Because the marriage of Lemon & Blueberry work so well, and it makes a difference to the usual Cinnamon Rolls, I thought I would post another fruity version. I knew I wanted to do something along the lines of Raspberry as I have seemed to have consumed SO MANY this year already that it might a well continue, so I thought what can I marry the flavours with? 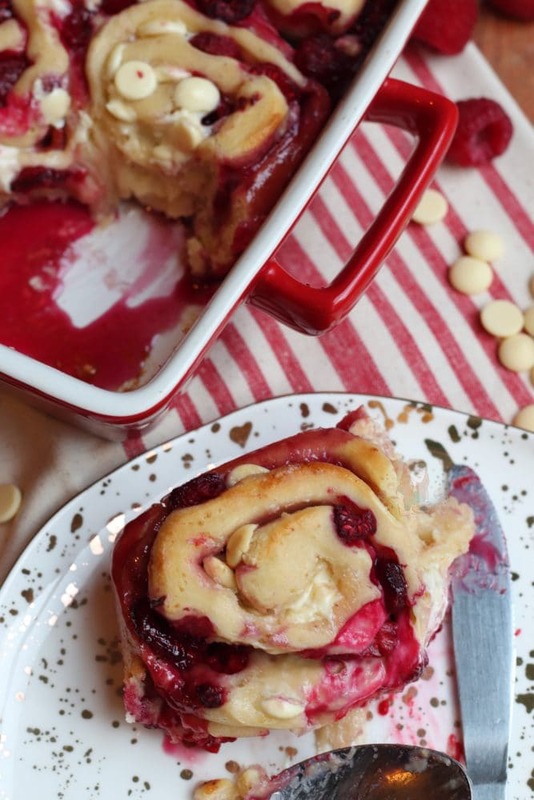 I didn’t want the Raspberry Sweet Rolls to be bland, so I used Lemon Zest in the dough, the same as my Lemon & Blueberry Sweet Rolls… but then I thought I don’t want them to be the EXACT SAME, so put some White Chocolate Chips in. This is completely optional, but White Chocolate and Raspberry are such a deeeelicious combo that it would have been rude to not try it! 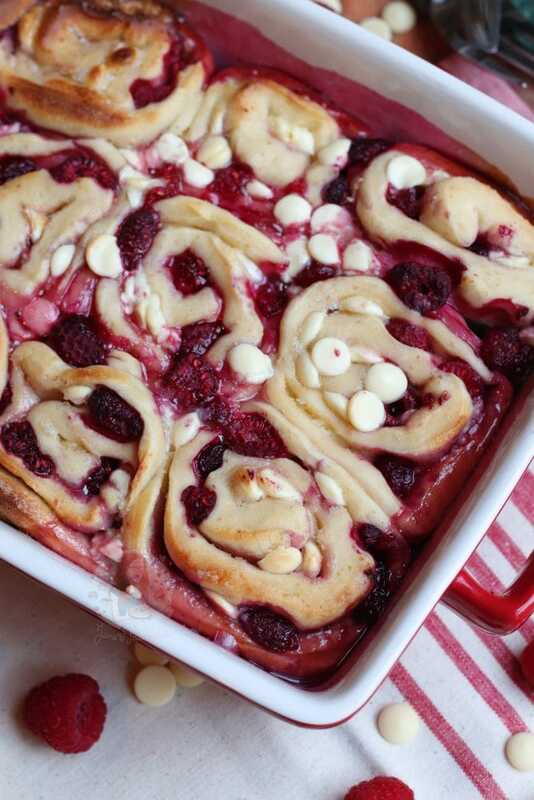 White Chocolate and Raspberry can work in so many ways, such as with my White Chocolate & Raspberry Cheesecake, or my White Chocolate & Raspberry Cookies for example. The possibilities when combining these flavours is pretty much endless, so I thought why not make it happen in the Sweet Rolls as well?! Luckily I believe Lemon and White Chocolate go together very well as well, so the three flavours together are wonderful. The flavours of the Lemon in the dough aren’t the strongest ever, but its subtle enough to not overpower the raspberry (which is obviously important), but strong enough to not be pointless. You could easily swap it for vanilla, and use 1-2tsps in the dough, but that’s up to you. I’m not sure orange would work, as I prefer that to be with Milk chocolate or Dark Chocolate, but if that flavour combo floats your boat then go ahead! Basically, it’s very easy to adapt and choose! Definitely try it this way first, however, it’s honestly delicious! 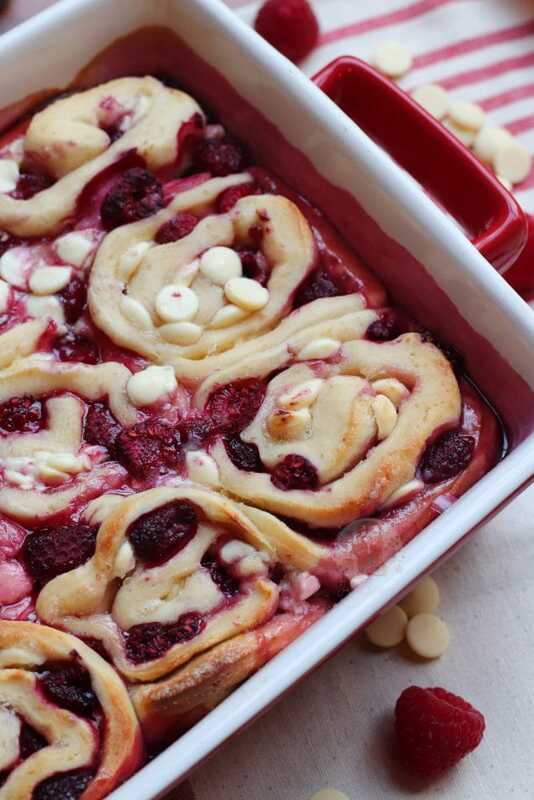 For this particular batch, I used Frozen Raspberries and it basically made a Raspberry Sauce itself (through them thawing and then baking) and it made such a gooey delicious mess that I couldn’t resist recommending them to others. 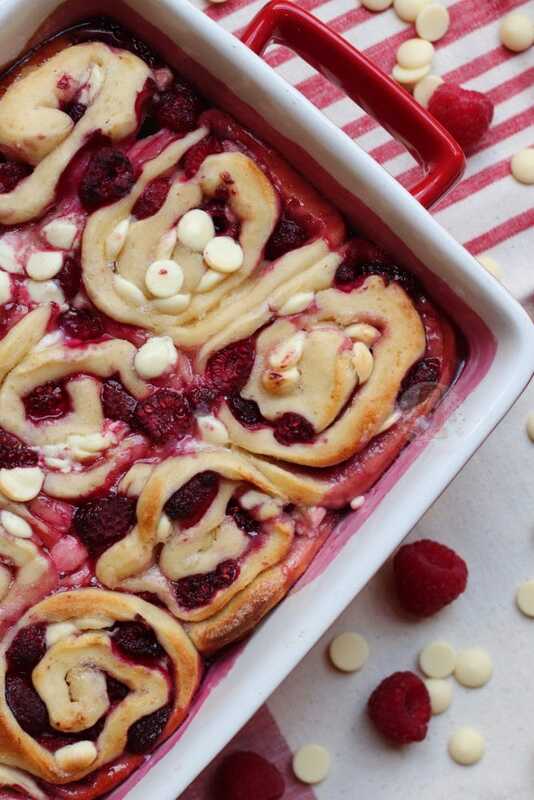 The handy thing about using Frozen Raspberries as well is that you can buy them from supermarkets pretty much year round, but they have a good flavour! It beats buying raspberries out of season when they’re expensive, and taste often of nothing. I wasn’t too sure how to decorate these, because classically with Cinnamon Rolls you utterly smother them in icing, which is what I’ve done before, and it works well. After baking, however, I could see how damn pretty they were without anything on top, so just left them bare! Feel free to decorate with an icing drizzle, melted chocolate, etc! I know these sort of things seem a bit faffy to make, but they’re not. I do have it easier by using a stand mixer with a dough hook, but I don’t always use it. Kneading bread dough by hand can actually be quite therapeutic, and when I was at cookery school we did it multiple times a week. Knowing that what you have spent time kneading ends up being something utterly delicious makes it so worth it for me! Enjoy! 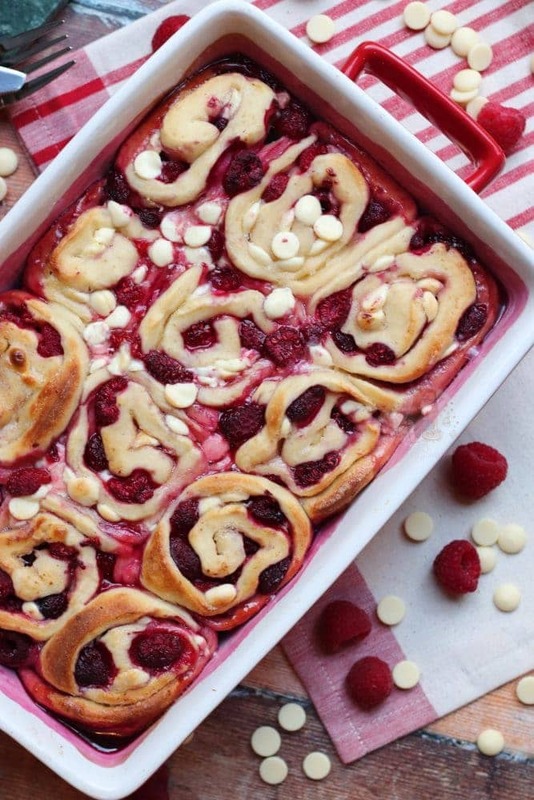 Sweet, Soft, Delicious and Moreish White Chocolate and Raspberry Sweet Rolls! Sift the Flour into a large bowl, and add the Sugar and Yeast. Mix it around a bit with a spoon so its all combined. Rub the Butter in with your fingers until it resembles breadcrumbs - or, add the ingredients to a food processor and whizz it up to get the same affect. Add the Lemon Zest to the mixture. Heat the Mil Gently until warm - make sure its not too hot. It should be just about steaming, but definitely nowhere near boiling! Add the Milk and Egg into the dough, and knead the mixture for about 7-10 minutes. I use my Kitchenaid with the Dough Hook so it takes about 6-7 minutes, and I don't get messy! The Dough will be done when you press it in, and it springs back. It should also not be sticky anymore. Move the kneaded Dough to a lightly oiled bowl (a large bowl so it has room to grow) and leave it in a warm place for 1-2 hours, or until doubled in size. If its a cold day, it can take longer. Once the Dough has risen, remove it from the Bowl, and roll out onto a lightly floured work surface. 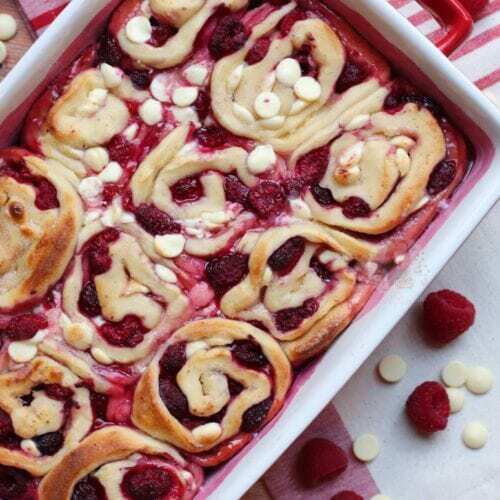 Gently brush the surface of the dough with the melted butter - sprinkle over the Sugar, and then sprinkle over the Raspberries and White Chocolate Chips. Roll the dough from long end to long end (so you have a longer sausage compared to a short stubby sausage) carefully but tightly. Cut this carefully into 12 equal sized pieces, and put into a rectangular oven dish (mine was 12x9" in size). Cover again, and leave to rise for an hour. Towards the end of the hour, turn the oven on to 180C Fan, and when its fully risen, bake in the oven for 20-25 minutes. 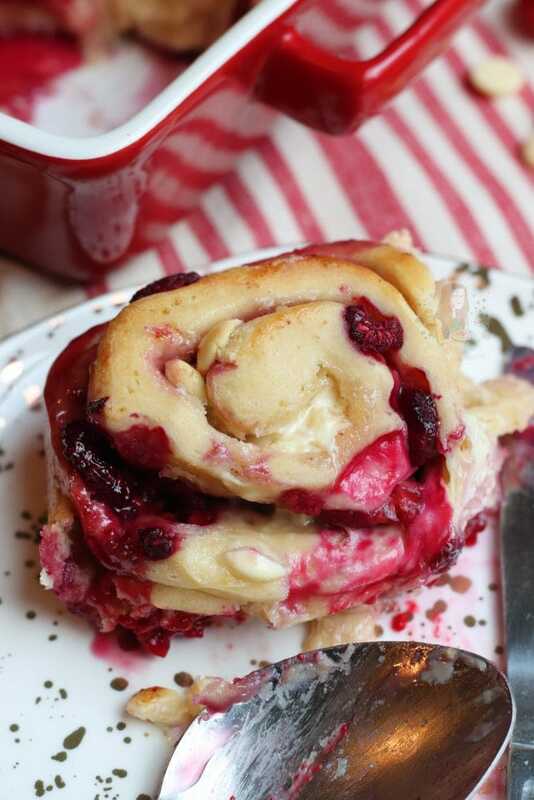 I used Frozen Raspberries as they produce a delicious raspberry like sauce that makes the Rolls gooey. The White Chocolate Chips are optional, but delicious. You could easily swap the Fruit for a different flavour if you wish! The Lemon is optional, but also tasty. These are best on the day of baking, or the day after. If storing, keep at room temperature but covered so they don't go stale. Older Next post: Christmas Chocolate Cake! 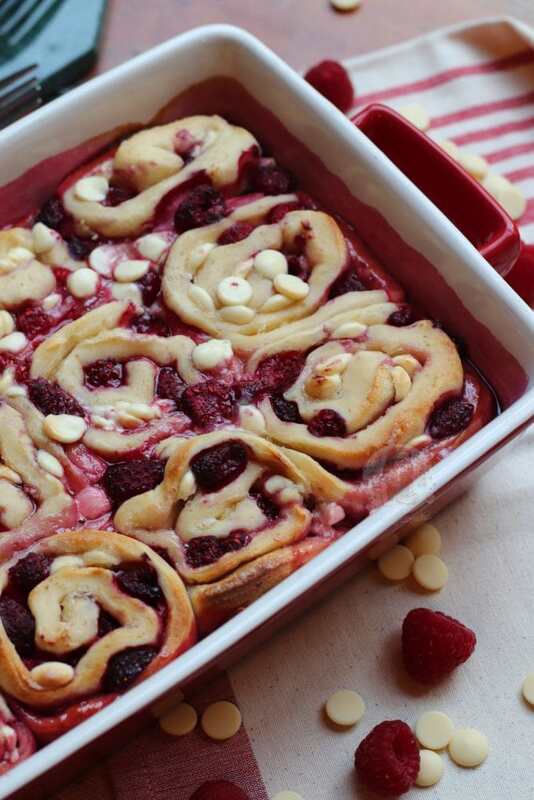 You said the raspberries make a coolie themselves from thawing and baking. Do I thaw the berries and THEN put them in the dough and bake. Or straight from the freezer, into the dough – roll prove, bake?? You just put them straight in – don’t thaw before baking! Loved this recipe! worked so so well!! Do you use the fast acting yeast for these rolls? I used dried active yeast!